You did what with a hot dog? 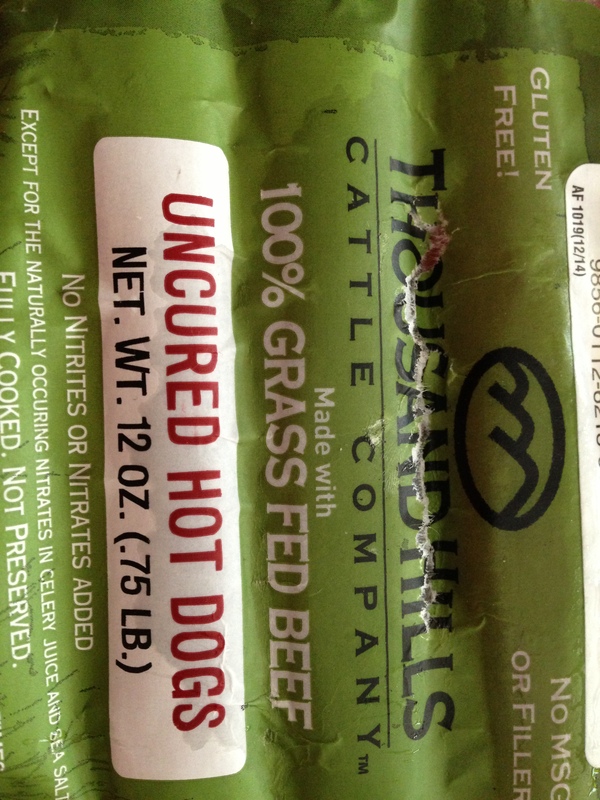 These are the best hot dogs EVER. They sell them at Target. I don’t go to Target often for groceries, but they have good meat. 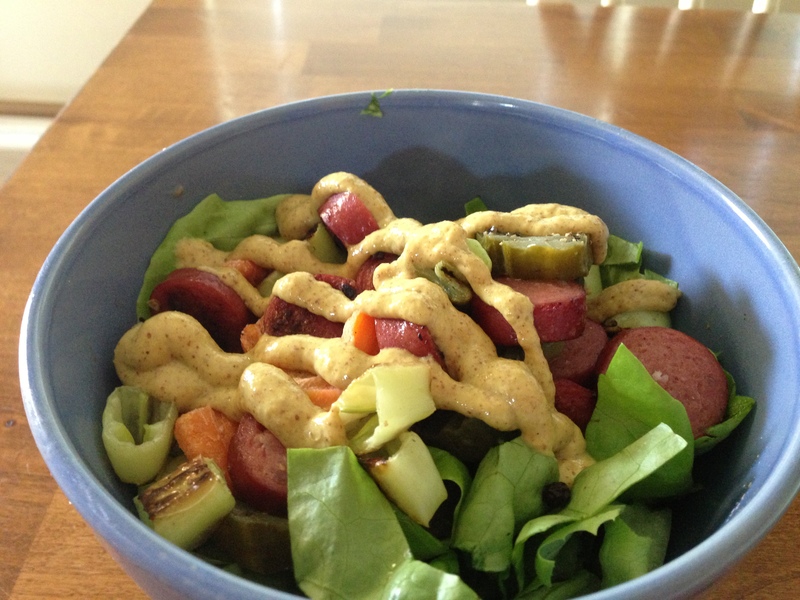 I needed a quick lunch on Saturday, so the hot-dog salad was born. New recipe for me this week. I had a big vac-saver bag of venison tenderloin in the freezer and I wanted to do something different. Found this on recipezaar (thanks user TCSmooth!). 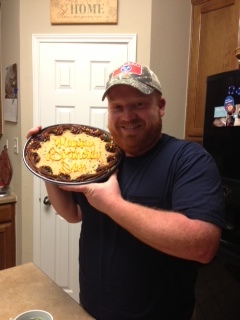 Apparently it’s been the top venison recipe for like 8 years! I’d imagine this would be awesome with beef too. I didn’t do the bacon, I didn’t have any (but I will be trying next time). I baked half (to eat later) and cooked the other half as medallions on the stovetop. 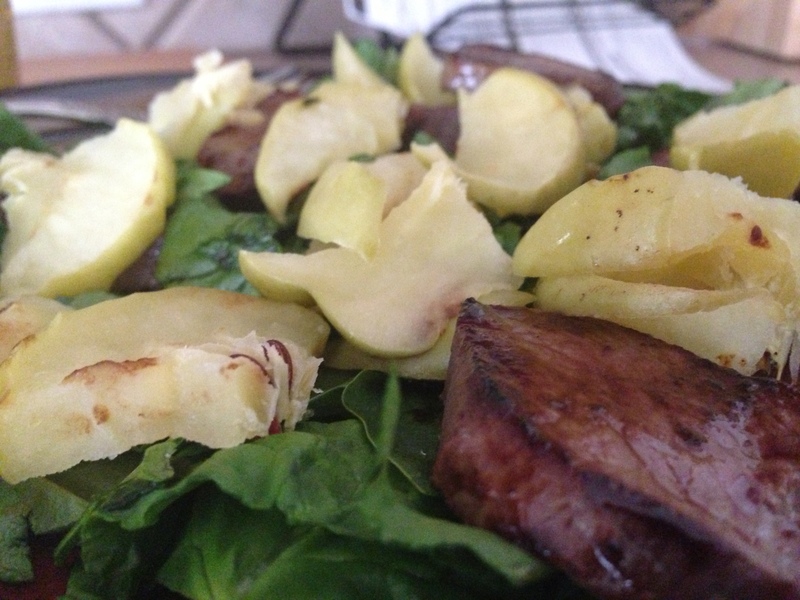 Since I didn’t really want to put forth much effort, I sliced and added to a salad with sliced and cooked granny smith apple. Sprouts had peppers on sale on Sunday, so I decided it was time for stuffed peppers! Just a little something I threw together as I was making it. First, I made my own chorizo. 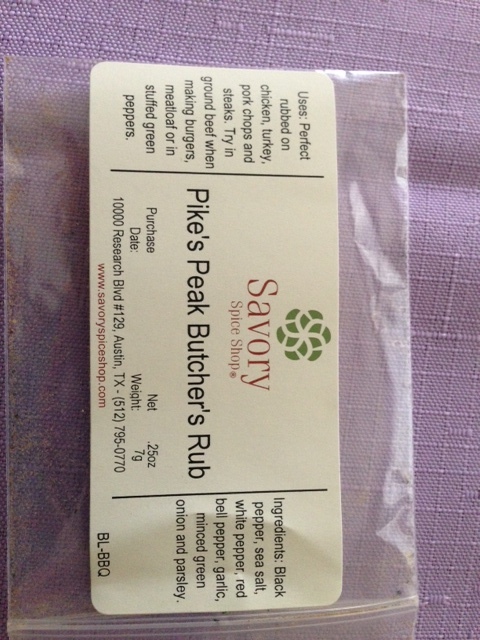 Savory Spice shop chorizo seasoning. You add it to whatever type of ground meat you want, add vinegar (I use apple cider) and water and mix, then chill for a few hours or longer. The directions are on the side of the package. 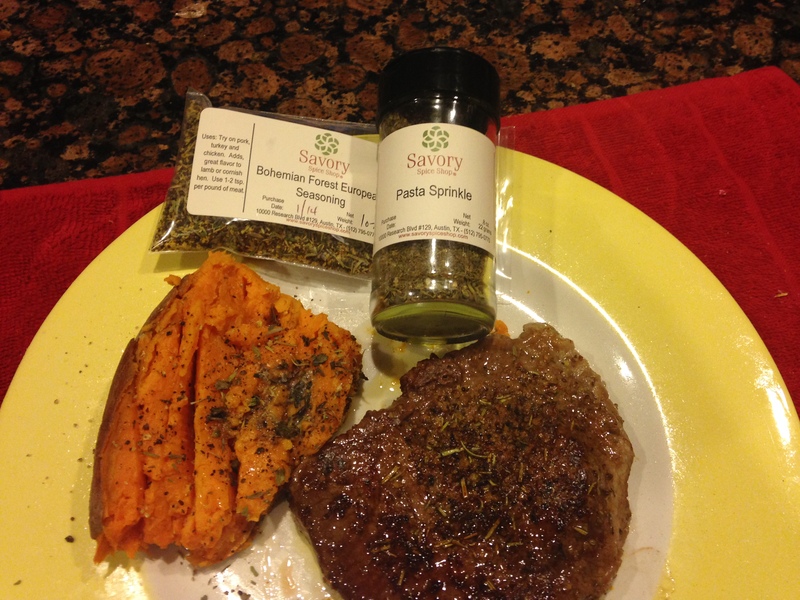 I like this seasoning so much, I have a big bottle of it. Pull the tops off of the bell peppers and remove the seeds. 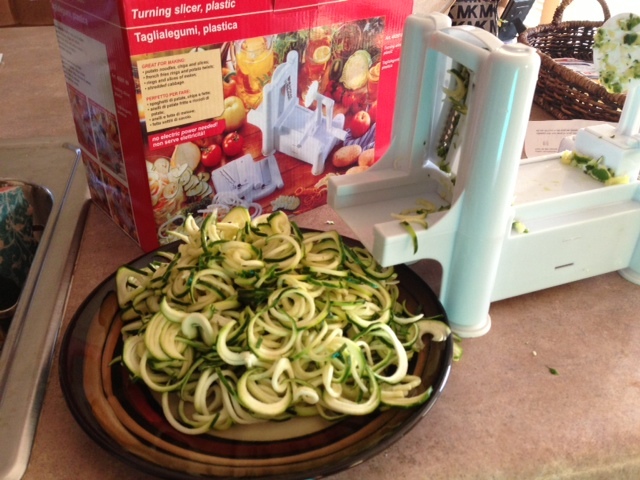 You can either cut up the tops (minus the stem) and throw in the mixture, or toss them in trash. Put the 4 bell pepper bottoms in a pot of boiling water and boil 4-5 minutes. Remove from the water and dry them off. 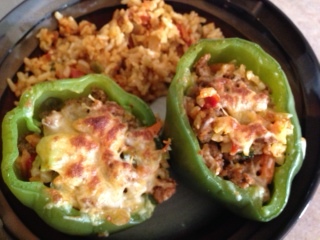 In a skillet combine the mixed veggies, rice, and meat/meat sub and heat until warm. 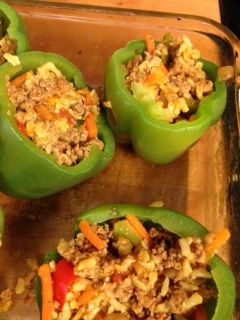 Then stuff each pepper with the mixture. Place in a greased 8×8 pan and bake covered with foil, for 20 minutes. Remove foil, top with cheese if desired and broil until melted and bubbly. Dan LOVED these. Good. Because we are having them as leftovers tonight. It’s LUNA run night and we always have leftovers on Tuesdays, because I don’t have time to cook. I am already doing well not to gnaw my arm off before I get home at 8 pm. 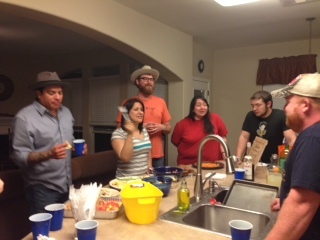 We had a few people over last weekend. 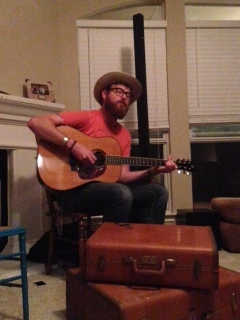 Dan and I hosted our very first party and first house concert, featuring Drew Kennedy. 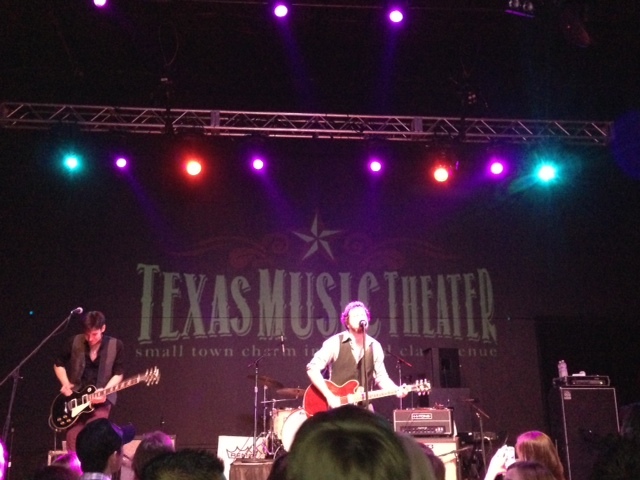 The concert was also used as a kick-start for his new album, which he played in it’s entirety. No, it’s not cheap, but it’s really a neat experience to go to. Small number of people and very intimate. 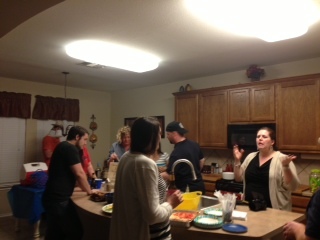 This was the 3rd or 4th i’ve been to, but our first time hosting. It was hard, because we couldn’t invite everyone, in fact, I didn’t have anything to do with the logistics other than being there and getting the massive amount of groceries and helping food prep. The food was awesome, or at least I thought so. 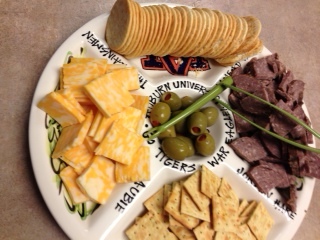 I finally got to use my new Auburn serving platter! That’s homemade jalapeno summer sausage that my dad made. 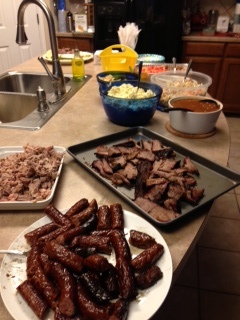 Dan smoked a bunch of meat (bacon wrapped pork tenderloins, Canecuh sausages from Alabama, and a brisket), made his mom’s potato salad, beans, I made my mom’s famous 7 layer dip. 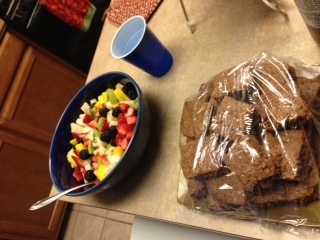 We also had people bring oriental slaw, 7 layer greek dip, brownies, an awesome fruit bowl, and lots of drinks (our whole kitchen table was a bar). I think it’s safe to say, a good time was had by all. The evening ended with a 18 person slumber party! It’s a good thing we have room. 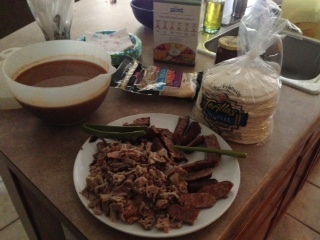 The next morning the yummy bbq was converted into breakfast tacos. 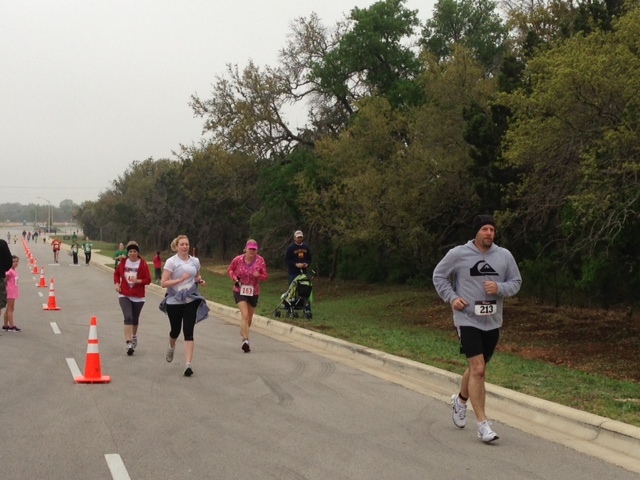 I cropped this so you can’t see the disaster my house was on Sunday morning! It got cleaned up for the most part, but then we all went to the softball benefit and I never finished the job. Not spotless, but it’ll do until the weekend.